Strong public interest in the upcoming visit of Archbishop Desmond Tutu has led The Episcopal Church’s Cathedral of Saint Andrew to move a free public lecture to a larger venue. Archbishop Tutu will be in the Islands at the invitation of the Dean of the Cathedral of Saint Andrew, The Very Reverend Walter Brownridge. The Peggy Kai Lecture, which will feature the 1984 Nobel Peace Prize laureate, will now be held on Saturday, August 4 at 10 a.m. at the Cathedral of Saint Andrew. The Cathedral has more than twice the seating capacity of the lecture’s original venue, Tenney Theater, which is on the grounds of the Cathedral. Reservations are required for seating at the event. However, demand for free tickets to Archbishop Tutu’s lecture has been so strong that the Cathedral’s more than 500 seats are already booked, and additional ticket holders will be accommodated at either Tenney Theater, which can seat 300 people, or on the grounds of the Cathedral. A live audio feed from the Cathedral will be provided in both Tenney Theater and to those on the church grounds. Tickets may be reserved by contacting the Cathedral of Saint Andrew at 524-2822 or by visiting www.tutuatthecathedralofstandrew.org. There is a limit of two tickets per person. -An Evening With Archbishop Desmond Tutu on Friday, August 3, 6 p.m. at the Cathedral of Saint Andrew. Archbishop Tutu will engage in a lively conversation with Leslie Wilcox, president and CEO of PBS Hawaii, in the historic Cathedral. 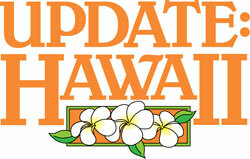 Prior to the Conversation, guests will enjoy a reception catered by the Halekulani. Tickets are $500 per person for reserved seating, and $1,000 per person for the Archbishop’s Circle, which includes premium reserved seating near the Conversation stage, a special reception and photo with Archbishop Tutu. -Choral Eucharist on Sunday, August 5 from 9:30 a.m. at the Cathedral of Saint Andrew. Archbishop Tutu will be the preacher for the Sunday Holy Communion service. The Right Reverend Robert L. Fitzpatrick, Bishop of Hawai’i, will be the service’s celebrant. The public is invited; there is no admission charge. -Interfaith Prayer Service on Sunday, August 5 from 5:30 p.m. at the Cathedral of Saint Andrew. Archbishop Tutu will join leaders from Hawai’i’s other faiths and denominations at an interfaith prayer service. He will participate in the service, but is not scheduled to speak. The public is invited; there is no admission charge. For more information on Archbishop Tutu’s visit to Hawai’i, and to buy tickets or make reservations for any of the events, please visit www.tutuatthecathedralofstandrew.org.